Elijah made his third appearance in a newspaper today! This time he made it into the Star News, our local newspaper. It was awesome to see his little face in the paper again and we loved that they put so many photos in with the article. Now everyone can see how cute he is. We're thankful for the exposure - not only for Elijah and his miraculous story, but also for HBOT. Perhaps someone else will look into it and be helped by it. (If you want to see the online version, click here). It hasn't escaped us that the article just came out today and is already outdated. Who knew that when we gave the interview about two weeks ago – that he would be walking by the time it was published? I –for one – am in still in shock that Elijah is walking. I have to pinch myself when I turn around and find our boy not only standing, but then walking away from me. I often have to drop whatever I am doing to follow him. It's crazy fun and I feel so blessed. Speaking of crazy fun, it's been so amusing to show off Elijah's new walking skills to his therapists this week. We saw Elijah's D.O., Dr. Loafer, today and he called Elijah's walking "amazing." Yesterday was Elijah's clinic-based therapy and his PT and OT were blown away. His OT was excited and I was thrilled when Elijah actually took some pegs out of board by himself. His fine motor skills remain the most delayed and we're hoping that once Elijah gets bored with walking, he will focus more on using his hands to grab and his mouth to speak. Then we saw Elijah's PT. I set Elijah on the floor and said, "Do you want to see Elijah's new trick?" His PT was in shock when he not only took steps, but started walking around the room. She kept saying, "That is UNBELIEVABLE!" She admitted that she hadn't expected Elijah to be walking independently for quite awhile. She was impressed with his ability to turn while walking; "That's hard," she said. She also told me that most kids when they start walking take a couple of months to get into standing by themselves and he's doing it already! She told me all sorts of encouraging things, like she's never really worked with a child quite like Elijah. She also said that none of the rules seem to apply to Elijah. She watched Elijah walk around the room and told me that his walking looks great – that he looks like any other kid would look when taking steps and when he gets himself into standing. I think she was utterly shocked and amazed at this huge change in his development and told us, "Congratulations" when we left for home. I wish I would've gotten some of those reactions this week on video! It's been a great week for our famous little guy. I think the more press for causes like this the better!!! Hello, my name is Mindy Dahlberg and I was given an article to read today by my mother in law. Elijah is a truly amazing little boy. Brecken also suffered from seizures right after birth. Brecken under went brain cooling to help prevent any further brain damage. At 3 days old, he was diagnosed with Cerebral Palsy. Brecken is now 17 months old and has not crawled, walked or talked. Brecken has a feeding tube to supplement his calories, as he is not a great eater. He also has physical therapy twice a week, feeding therapy, OT & special education once a week. With all of his doctor appointments, therapy and working a full time job, I have not had a lot of time to do research into the HBOT. My husband Jason and I would love to meet you and your family. If you are willing to, please email me at dahlberg1785@aol.com or you can visit Brecken's Caringbridge site at www.caringbridge.org and you enter breckendahlberg and this will take you to his page. That is just great!!! I am proud for you! 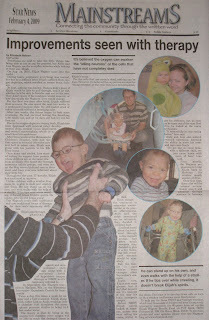 Max has been in newspapers several times. Like Elijah, he's cute, and makes for a good photo! Hello! I live in Zimmerman, and saw your son in the paper. Amazing! Thanks for the comments everyone! I know this is a delayed response, but it really does mean a lot to me. Rich-I checked out Cole's site. He seems to be one amazing little guy with an amazing companion in Ilia. Mindy- Thanks for contacting us. I really enjoyed talking to last weekend. I'm glad we've "met". Ellen-Thanks so much for cheering on Elijah! Maureen- Let me know if you want any more info from me. I hope I was of some help to you!